Has Barack Obama violated the Federal Hobbs Act with HAMP, and if so this felony action should be an impeachable offense. ...makes it a felony for a public official to extort property under color of office. Trading campaign contributions for promises of official actions or inactions are also prohibited under the act. It sure looks like Barack Obama has extorted property under the color of office based on HAMP (home affordable mortgage program). The law is that; Whoever in any way or degree conspire to extort property (TAX MONEY IS PROPERTY) in furtherance of a plan or purpose, CONSPIRE to EXTORT in violation of the ACT, (Hobbs Act) under color of official right, (ANYONE WORKING FOR THE GOVERNMENT), within the United States or Territories is in violation of the ACT (HOBBS ACT) and shall be fined and IMPRISONED not more than twenty years or both. YOU CAN ALSO CHARGE THESE PUBLIC OFFICIALS WITH CONSPIRACY, CORRUPTION, ABUSE OF OFFICE, ETC, ETC, ETC! It is pretty clear to me that forcing homeowners to default on their mortgage before offering them a tax based government relief program is extortion, while using that same program to garner favorable public reaction by implying that the president is "helping people", when he is not, is a Hobbs Violation coming and going. If there is a loophole in the Federal Hobbs Act, it might be that Barack Obama has extorted property for the benefit of others, rather than for himself, but, is that really a distinction with a difference? And, if any of the benefactors of extorted property make a political donation to Barack Obama, then the loop would be complete. So just how has Barack Obama possibly violated the Federal Hobbs Act? Barack Obama and his administration offered a taxpayer funded program to economically struggling homeowners (HAMP), but for a homeowner to just attempt to apply for the program required that their home be put into Parallel Foreclosure. Parallel Foreclosure basically means the banks have a justifiable reason to foreclose on your home and can begin processing all paperwork to kick you out of your home and resell it, while in the process leaving you financially devastated for years to come. To apply for HAMP, a home owner MUST BE 3 TO 4 MONTHS behind in their mortgage payments. Ergo, Barack Obama and his administration are using taxpayer funds to lure homeowners into parallel foreclosure prior to any HAMP assistance being offered. It sure looks like the present administration is using taxpayer funds to extort property, and I believe this is a clear violation of the Federal Hobbs Act. Some may argue, "but, the HAMP program had good intentions and you can't impeach a president for having good intentions". The key here is the good intentions are simply the sound bites that we heard that promoted HAMP as a good intention. There can be no good intention when to access a government program you have to agree to give up your home, especially when the purpose of the program was to SAVE your home from foreclosure. I have believed for the past few months that Barack Obama has committed an impeachable act, but I did not know about the Federal Hobbs Act. I just learned about the Federal Hobbs act after googling the term "quid pro quo". I just felt that the HAMP program was a quid pro quo, and I was curious if that violated the law in anyway. George Bush Sr. referenced quid pro quo during his time in office to deny that "quid pro quo" occurred in regards to arms being exchanged for other benefits. I don't recall if it involved the release of hostages or if it was some other benefit that Bush was denying had taken place. So suddenly I see the Federal Hobbs Act listed under a definition of Quid Pro Quo, and the very definition of the Federal Hobbs Act is exactly what Barack Obama has done wrong. I knew that HAMP was wrong, and that the initiators of the HAMP act must be held accountable, but now I can attach a legal, rule of law definition to it, the Federal Hobbs Act of 1951 and 1994. I can Prove Sarah Palin is not for Main Street. I can prove Sarah Palin is not for Main Street. Show me one speech or transcript where Sarah Palin talks about homeowners being screwed over by the banks in a myriad of ways. If you don't believe the banks are putting it to HUNDREDS OF THOUSANDS OF homeowners above and beyond the "deadbeats" that want their home for next to free, check out Swarm the Banks. Or, just watch the running clock below that lists how many home foreclosures since the beginning of 2009. Are the over 4 million foreclosed homeowners all deadbeats? Just how many republican politicians have said ANYTHING about home foreclosures? I'm not saying the democrats are any better, and I do believe Barack Obama has ALREADY committed impeachable acts via his handling of the HAMP program and the programs that have allowed the banks to misrepresent their actual debts. You really should look long and hard at voting for third party candidates. If not now, when? Has Barack Obama committed an Impeachable Act regarding his Government bailout programs for Home Owners? There is so much internet information being generated on a daily basis that nowadays it doesn't necessarily take a pulitizer prize winning journalist to discover a sleazy sequence of political actions that may be illegal and possibly an impeachable act, the research can also happen by accident. Barack Obama has this strange habit of offering government programs to "financially assist" struggling homeowners, in exchange for their homes! When Barack Obama proposed the HAMP (Home Affordable Mortgage Program) to struggling homeowners, the caveat was the homeowner had to fall behind on their mortgage payments to apply to the program! The problem with becoming eligible for HAMP by falling behind on ones mortgage payment is the banks immediately begin a process called "parallel foreclosure". Parallel Foreclosure was a term I accidentally stumbled upon while doing research about Chase Bank. The term parallel foreclosure is so rare that until I started blogging about it, there was virtually nothing about it on the internet. Even one year later, the first few google search hits for parallel foreclosure are from comments and articles that I have written about it. Parallel Foreclosure basically means the banks start home foreclosure paperwork the moment a homeowner applies for a government program that is designed to reduce their home mortgage payment or offer some type of federal assistance so the homeowner can afford their home mortgage payment! HAMP and the resulting Parallel Foreclosure is not enough to impeach Barack Obama. However, I just discovered the following article from the Minnesota Independent from August 11, 2010, and suddenly, impeachment of Barack Obama seems like a fair and honorable course to take because ONCE AGAIN, Barack Obama has implemented ANOTHER homeowner assistance program that ALSO causes parallel foreclosure to occur. The Minnesota Independent article is about a NEW UNEMPLOYED homeowners help program, EHLP (Unemployed Home Loan Program), and you guessed it, once again, the homeowner MUST BE THREE MONTHS BEHIND in their mortgage payments to "qualify". The sad thing is the rest of the program seems decent. Anybody who qualifies for the program gets a 50,000 dollar, interest free loan and two years to find work if they demonstrate a realistic plan to find employment. I understand that if getting behind on a mortgage payment was not a pre-requisite for both of these federally backed homeonwer programs than perhaps an enormous amount of homeowners would try applying for the program. But, the triggering of parallel foreclosure in TWO SEPARATE INSTANCES of government programs designed to "help" the homeowner demonstrates a contempt for the struggling homeowner. Furthermore, the requirement of becoming late on a mortgage payment before becoming "eligible" for the government program is most likely a spirit and pride killer for the average american citizen. But these two homeowner assistance programs go deeper than just contempt for the struggling homeowner and the loss of their home. Homeowners are also losing either their original home mortgage down payment, or access to home equity lines of credit when their homes are repossessed. And lets not forget, the Barack Obama back home mortgage programs ACTUALLY DON'T WORK for MOST APPLICANTS. If the programs don't work for most applicants, and to become eligible for the program one must get behind on their mortgage payments which in turn kicks in parallel foreclosure procedures, one can see that these home mortgage programs are highly unethical and to a large degree, "legalized theft", and somebody should be held responsible, and possibly impeached for creating these programs. HUD will get funds that they will keep and not help anyone. We went through the entire program and were denied any assistance. They kept changing what qualifications were needed to meet their program guideline to receive help. We met all of them. They sent us to a financial counselor, (who told us our problem was we weren’t bringing in enough money) okay..I did learn to add and subtract in elementary school. So…will this new program really help anyone or will the State’s government programs just keep the money within their departments for their own use like they have in the past. We eventually had our mortgage payments lowered by the bank (not much $40). Again, we are behind. The banks aren’t helping either. We have equity in our home but if we can’t sell our home it doesn’t matter how much equity a homeowner has left in their home. And yet, it SHOULD MATTER how much equity is in a home before that home is foreclosed upon. Jerry Brown detractors over his staff's use of the "w" word are missing the real issue. I am fascinated at the attempt to derail Jerry Brown over the "w" word that was used by one or two of his staff members. People are now digging up old Jerry Brownisms and trying to club him over the head with it. I find the attempt to derail Brown laughable. As I begin to read the old Brown comments that are supposed to shame Brown, the one thing that stands out is Jerry Brown ALWAYS references something when he makes his controverisal comment. It's one thing to quote Jerry Brown saying "Abortion is the taking of the life" to stir up the pro choice crowd, but Brown references it with "When I spent time with Mother Theresa..."
lol, what male can make the claim that they spent time with Mother Theresa...yet somehow this is supposed to be controversial and prove that Brown is a bad man who hates woman??? How can we possibly get from visiting with Mother Theresa to being a bad male for being influenced by her? "But, but, he flip flopped on the issue of abortion to serve his own agenda". WHO DOESN'T! The issue of abortion by its very nature should never have 100% of the people believing the same way. Anybody who believes there will ever be a kumbaya moment on the issue of abortion where everybody agrees is being obtuse, and if that moment of 100% agreement on the issue did ever happen, all I can say is we probably have become Eloi in a world run by Morlocks. The first rule of a non issue comment that is being attempted to be used to slam someone is that it needs to be said without any external context as a reference point. Brown uses external references when he makes most of his more "controversial" statements. You can call Brown a thinker who talks too much, would that make some happy? As for the "w" comment, once again it was said within the context of a situation that was at hand, and apparently a female staffer used the phrase as well. The real issue is not what it appears. The real issue is that women are defined as being an "s" or a "w" in certain situations, but what is the same derogatory word for men who behave in a similar manner? That is what feminists should be up in arms over, that labels exist to describe women who behave in irresponsible ways, but those same derogatory words do not really exist, or stick, for men who behave just as badly. Rush Limbaugh says it is imperative that Republican Politicians feel your pain! Friday, October 8, 2010, 10:42am pacific coast time I heard Rush Limbaugh say to his radio audience that it is imperative that Republican politicians empathize with their constituents. This is code speak for, "I feel your pain", the all time number one Bill Clinton quote that Rush Limbaugh ridiculed a multitude of times on his show when Bill Clinton was president. Rush would even do an impersonation of Bill Clinton while saying "I feel your pain". Now Rush is saying that empathy is how Republicans can win in November of 2010 and also win back the presidency in 2012. Not to be outdone, Barack Obama spoke glowingly of the Clinton record from the 90's at a Thursday, Oct. 7th, 2010 Bowie State University speech in Bowie, Md. First, Barack Obama praised the huge surplus Bill Clinton left behind and that the republicans then squandered. More amazingly, Barack Obama then warned his audience that the Republicans were outspending the democrats by as much as a 7-1 margin in some political races and that the money was coming from secret sources, including both corporate sources AND sources from outside of the country, and that this type of funding must not be allowed in the future. Barack Obama actually stated that we cannot have unknown sources of money manipulating american elections. Yes, Barack Obama actually said this at this speech. Before Barack Obama gave his speech, while he was reviewing the statements about secret funding sources, was he really able to do it without thinking that he did the exact same thing in 2008, first to defeat Hillary Clinton, then John McCain? When Barack Obama spoke glowingly of Bill Clinton's budget surplus legacy, and he knew that Hillary Clinton would have probably done an even better job, did Barack Obama tingle all over knowing that he had defeated the better candidate? What type of person can first dismiss another's record, then revere it two years later? What type of person can first do unethical, illegal funding tactics, then two years openly blame others for doing the same thing? I was starting to view Barack Obama as a president that simply wanted everything to run through his hands so he could get maximum credit for any resulting success. But the Bowie, Maryland speech has revealed a sociopathic side to Barack Obama that frustrates me for the condescending nature it reveals about our president. For being such a slim president, Barack Obama sure is willing to pull pilfer anything from the talking points buffet table at any time, for any purpose. Edit note (I started this article on Friday as draft, but did not finish and publish it until around noon on Saturday, yet the publish date claims I wrote it on Friday.) Google should fix this bug. Breaking News! Draft Hillary dot com is officially online. Draft Hillary dot com is officially online as of Oct. 8, 2010. Labels: Draft Hillary dot com. Breaking News, officially online. 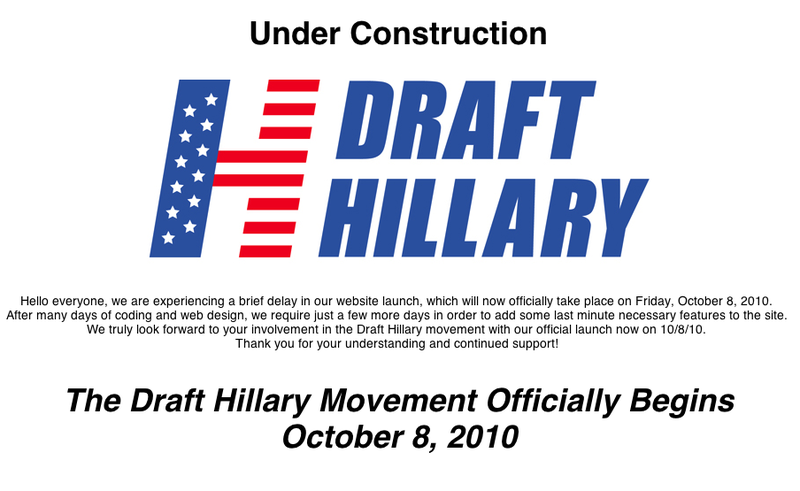 Draft Hillary dot com launch date moves to Oct. 8, 2010. 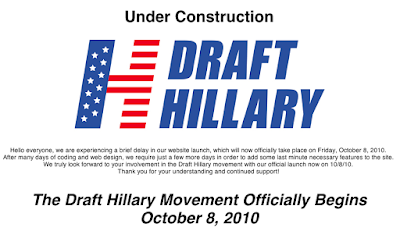 Draft Hillary dot com launch date has been moved to Oct.8, 2010.